This E.M.U. 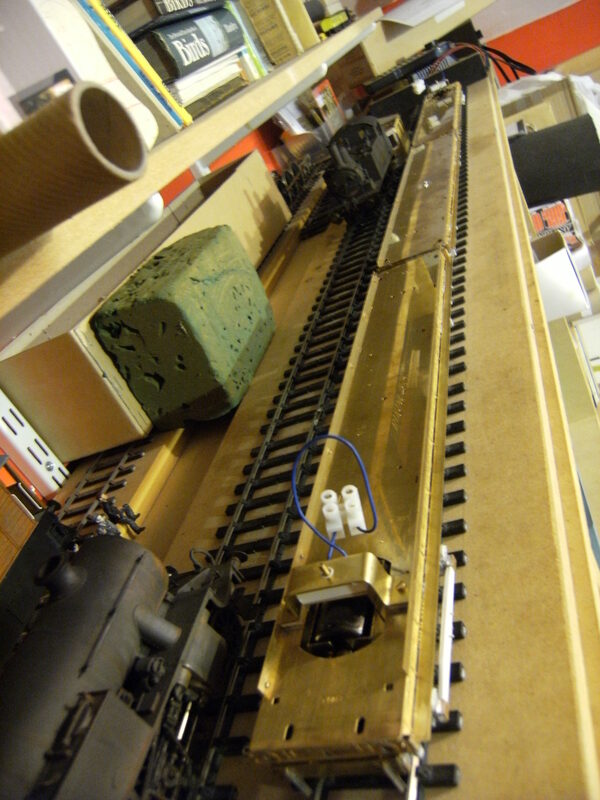 set is a semi scratch build utilising Southwark Bridge Models bogie block set coach kits, and the power bogies from Roxey Mouldings parts. An E.M.U. is an electric multiple unit, having electric motors normally mounted in the bogies at each end of the train, the conversion of the coaches would also involve building a cab for the driver at the end of the power cars. These collect power from a third rail, mainly seen on the Southern region South of London. The early ones were converted from ordinary carriages that were normally hauled by steam loco’s.Later modern stock being purpose-built. The prototypes were built in 1915 by the London & SouthWestern Railway, this particular model being of the pioneer set E1. 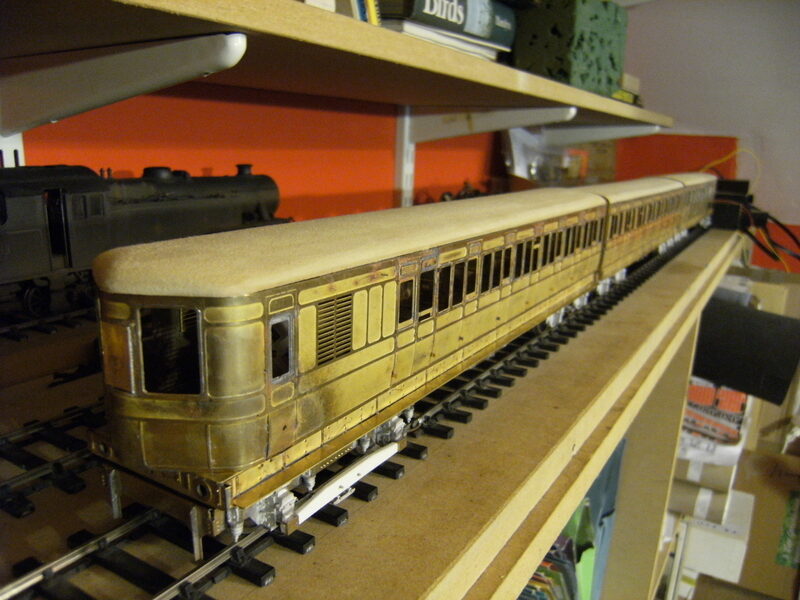 These were converted from existing LSWR steam stock, the power cars, with new cab sections added, being built from 51′ BK thirds and the centre car a 51′ Bi-composite. 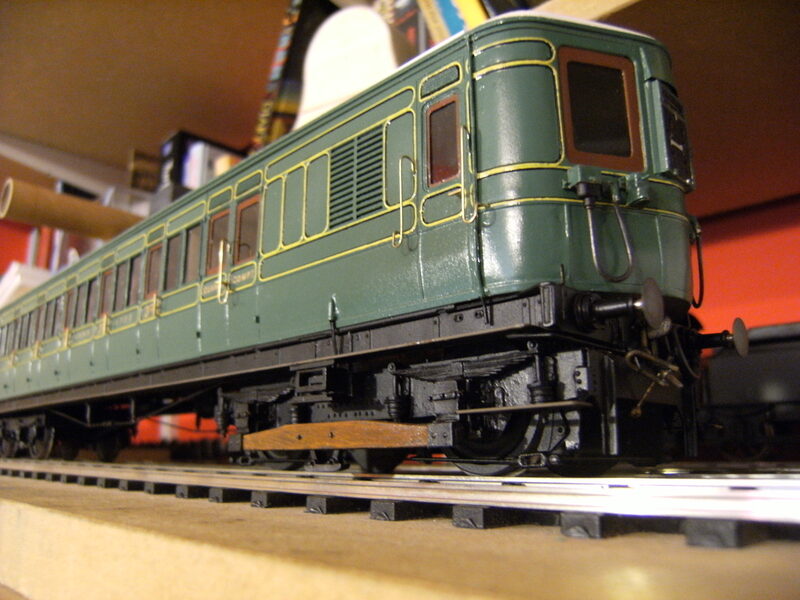 And so with the model I have converted the appropriate carriage kits in the same way as the prototype. 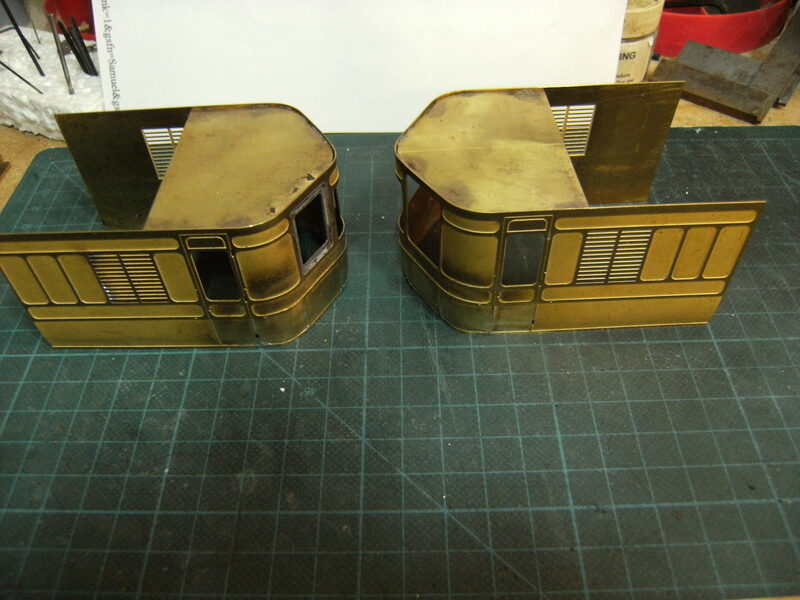 After spending some time on research, sourcing drawings and photo’s, some of which were supplied by my customer, the first job was to get an etch kit produced for the cab ends of the power cars, in brass, that would match up to the SB model’s kit. Art work for the cab sections was produced on a cad drawing programme and sent off to the etchers, I have to thank John Birch (a good friend and fellow S7 Group colleague) for his knowledge and invaluable help with this part of the project. The centre car is a fairly straight forward kit build the only major differences being the brake control system. On the E.M.U.’s they were Westinghouse air brakes so appropriate castings have been sourced to represent this on the chassis’s. 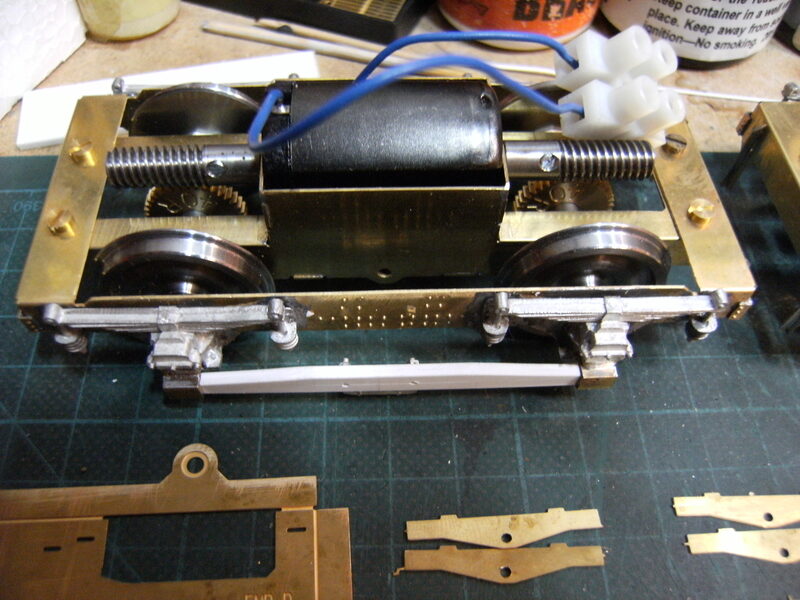 The power bogies are Roxey’s etches and castings using a Mashima motor driving on both axles. I had to replace the collecter shoe beam and brackets from scratch as the cast items that are supplied are too short and do not line up with the axle boxes. I had to cut a fairly large hole in the coach underframe floor and fabricate a mount for the pivot that cleared the top of the motor. The roofs were made from mdf, this being an inert material and it machines and sands easily too. When I was happy with the profile and fit to the bodys they were sealed with pva and re-sanded. 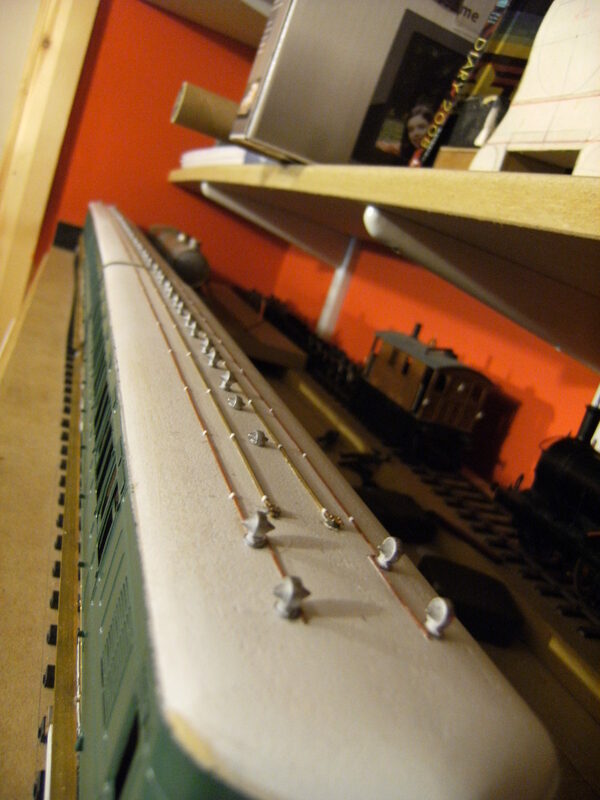 Cables, clips and vents were fitted, the cables were produced from brass wire and plastic rod with the clips made from thin strips of printing paper wrapped round and stuck with super glue, then the whole lot given a coat of white primer. The cantrail was made from small section square and flat strip plastic, this being fixed with daywat adhesive, you will also notice from the photo that the rain strip is missing, this has since been added, also made from plastic strip section. The interior’s have been fitted and painted. The seats are produced and painted in the same way as the roofs, from mdf, being fixed in place with epoxey resin. 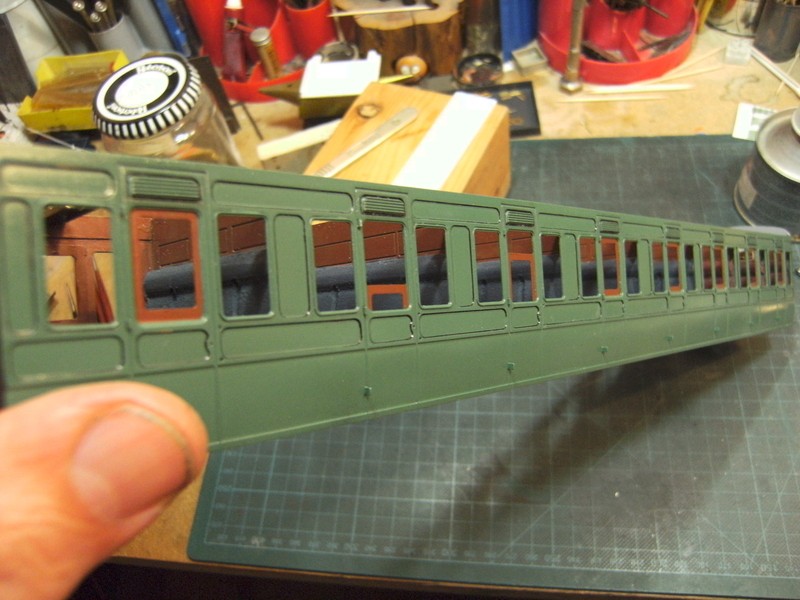 The final touch for the interiors will be the poster ads above the seats on the compartment divisions. The windows were masked off from inside with paper and the coach bodys primed and painted. Once this had hardened off the lining can start.